Life is very busy at the moment (new book out in June) so I am not able to post here as much as I'd like. I just want to quickly bring your attention to a fabulous new cook book from Galway-based cook and nutritionisit, Liz Nolan. 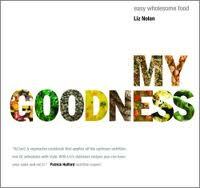 The book is called My Goodness and I went to the launch recently where I sampled some tasty treats from the recipes. Beautiful salads, pesto, hummus, dark choc truffles etc etc. I can't wait to start to try them myself. In the meantime, Liz runs veggie cookery classes and her website Wholefood Matters is here.